No. There are certain weight exemptions. Items below 1.0g of gold, below 7.78g for silver and below 0.5g for platinum are exempt. There are other exemptions to the Hallmarking Act – please refer to the Hallmarking Guidance Notes. If the item fails to reach the standard I submitted it at, will it be destroyed? Although it is within our rights to destroy items that do not reach standard, we rarely do so. With the variety of different finenesses available, we can usually hallmark the item at a lower standard. If any significant issues arise we would contact you before proceeding further. Can I apply my sponsor's mark to items that do not need hallmarking? Do I have to display a Dealer’s Notice? Yes! You may face a fine of £5000 if you do not display one. Print one for free from our Downloads. What does each mark in the hallmark mean? Do I have to send in findings / jump rings etc with my packet? Yes! All related precious metal elements as sold onto the consumer must be sent to us for testing All articles sent in should be clean and free from liquids and dust etc. This is especially relevant for second hand articles. My item is not complete, can I just send you the part that I want hallmarked? No, we need to see all the component parts of any item, even if these parts are not precious metals. That Includes scrolls on earrings and pins for brooches. Is a chain and its pendant one article or two? Are earrings/cufflinks classed as one article or two? Can my item have more than one full hallmark? An article can only have one full hallmark. It can have multiple part marks. Do you remove a sample for assaying from my item? We only remove samples from articles in a few circumstances. We mainly use non-destructive X-ray fluorescence technology as a sampling technique. Should I send my work in finished or unfinished? The choice is yours but either way, the work must be clean and free from dust. You should consider that the metal will displace when a hallmark is struck by hand. So, there may be bruising on the other side of the struck mark - your piece will need setting back to finish it up. Conversely, if you are sending items for laser marking, they should be sent in their finished stage as they can't withstand a heavy polishing. Our simple online registration guides you through the steps. See our Hallmarking Process pages. You can choose laser only, or laser and punch registration. Unlike other Assay Offices we don't charge extra to apply the hallmark by laser. If you select a laser-only package it means your hallmark will be applied by laser every time you send work in. (You could contact us to have a punch made of your sponsor’s mark at a later date, but this would be an additional purchase.) Read more about the different methods of hallmarking. You can register online here and will be guided through the choices. Do I need a separate sponsor’s mark for each metal type? No! One sponsor’s mark is all that you need to order, and forms part of your registration with us. Will my registration be covered for both the Hall and Greville Street? Yes, it covers both offices, but remember - if you only have one punch make sure the office best suited to your needs holds it for you. i.e. If it’s held at Goldsmiths’ Hall, but you request the hour service from Greville Street, we may not be able to complete your order. If you choose to hold your own sponsor’s mark, you must apply it to any items that you send to us to hallmark (or send your sponsor's punch to us along with the packet of your work so we can strike it for you). Average turnaround time is 4-5 days, you can request a faster service… Readmore about our differing Speeds of Service. Can I transfer my punch to Assay Office London from another office? How can I authorise someone else to use my sponsor's mark? Email registration@assayofficelondon.co.uk stating your account number, and the name of the person you are authorising to use your mark. When ordering a large punch, this will need to be struck harder, therefore not suitable for thin silver. Consider punch size - K, L or M swan neck to state that the K is for larger items, the L for standard and the M for fine, delicate or wire work. Read more about sizing. Can I order an additional punch online? Can I pay for a renewal online? Can keep my sponsor’s punch? The sponsor’s punch is the only one of the five you can keep yourself. Contact Registration for more information. What is the punch made of? A special type of hardened steel specially imported from America for its durability called W1 steel. The punches are made at our workshop within Goldsmiths’ Hall. Consider your piece, and the marks - When ordering a large punch, this will need to be struck harder, therefore not suitable for thin silver. Consider punch size - with a K, L or M swan neck punch, K is for larger items, the L for standard and the M for fine, delicate or wire work. What are the “rules” for sending articles made of “mixed metals”? For full info see page 8 of Hallmarking Guidance Notes. Precious metals rank in order as follows, starting with least precious: silver, palladium, gold, platinum. When an article comprises of two or more precious metals, the hallmark of the least precious metal is applied. Wherever possible a “part mark” (ie. The fineness mark of the more precious metal) is applied to the more precious metal component of the article. An article can only have one full hallmark, but it can have multiple part marks. Please note, mixed metals need to be distinguishable by colour in order to obtain both the full hallmark and the relevant part mark. There are exceptions to this rule – for example when a platinum article has small component parts consisting of 18ct gold, then the article may be hallmarked with a platinum full mark and the appropriate gold fineness mark. This will not apply if the gold components are 9ct or 14ct. For base metal, The +METAL mark is applied with the standard hallmark to distinguish base metal from precious metal parts. We must apply this, by law, even if you haven’t requested it. Can I post items to Greville Street? No, you can only post your packet to Goldsmiths’ Hall. What are the opening hours of the counters at The Hall and at Greville Street? Our counter at Goldsmiths Hall is open Monday to Friday 8am – 5pm, and the counter at Greville Street is open Monday to Friday 9am – 5pm. Neither close for lunch. Our other offices are by appointment only, or for private use. My sponsor’s punch is held at The Hall, but I would like the Early Hall service at Greville Street, is that OK? If you only have one punch make sure the office best suited to your needs holds it for you. i.e. If it’s held at The Hall, but you request the hour service from Greville Street, this makes things tricky for us to process… please call us to discuss this option. Do I need to fill in ALL my details on the hallnote every time I submit a packet? The traditional paper hallnote is available to download here. We do need all the info from you - your full name, address and account number (as registered) each time to ensure the packet is invoiced and marked correctly. Read a guide to completing your hallnote here. However, the online submission form remembers this information so you won't have to enter it each time. Submit your online hallnote in your Account section. The website guides you though the step-by-step process. Read a guide here. You can also track and pay for your packets in your Account area. Can I put different metals on one hallnote? Each metal and each standard need to be submitted with its own separate hallnote. Remember, one metal, one standard, one Hallnote submission! This reduces the likelihood of error and helps improve turnaround times. Please be as clear as possible when including marking instructions for us. Make sure we know exactly what you require, be clear and concise! If you do not want the hallmark to be applied in the default position (see info within The Hallmark section below) for the article, please use (non-permanent) marker pen to indicate where you want the mark and let us know the size (height in mm or mark size – see table here). Why do I have to state my service when delivering my work at the counter? What if I don’t have my packet ticket on collection? We require all packets to be picked up with the relevant ticket for security purposes. If you’re collecting a packet from the counter which you posted to us (so don’t have a packet ticket) - we need the original registered post receipt or your account number, or a copy of our email saying the packet is ready, and a form of ID. You may be charged an admin fee for a lost ticket at the discretion of our counter staff. What if a courier is sent to collect my packet, and they don’t have my ticket? We will need an email/letter from the company or person the packet belongs to detailing the packet number with the name of the courier company collecting. In the event of a lost ticket we require either an email/letter from the company the packet belongs to detailing the name of the person collecting. The named person will have to complete a lost ticket form at the counter detailing what the packet contains and present a form of ID. Or if the packet is in the name of the person collecting they will need to complete a lost ticket form and have a form of photo ID. You may be charged an admin fee for a lost ticket at the discretion of our counter staff. What is my packet number? If you use our online hallnotes, this will generate the packet number, and this packet will show up on online packet tracking also. If you are using paper hallnotes, and have posted your goods to us, call our Switchboard team and they can inform you of your packet number. Why do I have to write EARLY HALL on the outside of my packet? If you would like this priority service, you must write "EARLY HALL" on the outside of your packet so we can prioritise your packet correctly. Early Hall is our overnight service. At Goldsmiths' Hall we can process up to 30 items, ready by noon. At Greville Street we can process up to 10 items, ready by 4pm. Timeframes quoted may have to be extended at busy times. Read more about Speed of Services. What would be the best way to present my goods for hallmarking to avoid handling charge? In order to keep your costs to a minimum, please ensure you wrap items together as much as possible in a large piece of tissue paper or bubble wrap. Try and use the minimum amount of packaging without compromising the safety and security of your work. We are on hand to offer advice so if you are unsure of anything please get in touch. A jiffy bag/padded envelope/ box work well. The packaging must be able to contain the work and all necessary paperwork (where hallnote is not completed online etc). Remember that if the articles are sorted prior to submitting, and clearly and plainly packaged, we will be able to process your hallmarking more quickly. The easiest way to pay for your packet is online - log into My Account. Or you can pay by cash, cheque, debit/credit card at the counter on collection of your work. Please ensure to always use your account number as a reference when making a payment to us so we may allocate the payment to your account. When will my packet be ready? It’s a great idea to sign up to our online tracking service which means you receive email/text notifications when packets are ready. New registrants will be signed up automatically, everyone else can change their settings in the Account area. You can also manage text and email alerts online. How can my work be hallmarked quicker? We try to hallmark your work as quickly as possible. Do make sure your notes are as clear as possible on the hallnote, and that you don’t use excess packaging on your items. These simple steps can really help speed up the process! Or, alternatively, take a look at our Priority Services. Punches, clockwise from top right, lion passant (traditional fineness symbol), millesimal fineness mark (925 indicating Sterling silver), leopard's head town mark, date letter. Why is a display mark more money? The display mark, or “feature mark”, takes longer to apply. Read more about them at the bottom of this page. Do laser hallmarks rub off? 3D laser hallmarks have very similar wear characteristics to struck marks and have good wear durability, but they are best suited for finished articles as heavy sanding and polishing would remove them. Struck marks are more substantial and have a textural, “bitten” quality. Laser marking should only be used for finished/pre-finished work. Rough castings should not be laser marked as the mark will be easily polished out. Can my items be enamelled or plated before hallmarking? Yes. Enamel can't entirely cover the piece - there must be a gap we can access to test. What are the default positions in which you apply the hallmarks? Can I choose where the hallmark is positioned on my item? Under normal circumstances, it’s left to the discretion of the Assay Office to place the hallmark as appropriate, according to the product type, taking into account construction and the stage of manufacture when submitted – we have default positions in which we place the hallmark. Assay Office London has centuries of years' knowledge in this area, with in-house tool making facilities if required. However, if you have a specific size or place you want the mark placed, we suggest that you use a non-permanent marker to mark the position or discuss your requirements with a Marking Supervisor on or before submission. Please bear in mind that struck marks need to be supported with a tool in some way, so it is not always possible to mark in the desired position. Does my hallmark need to appear in a straight line or can it also be printed in a shape? Take a look at “Feature/Display Marks” at the bottom of this page, or withing the Hallmarking Services Download – all of these are available options to you. Why can’t you laser mark/engrave inside this ring with a large head? The laser fires its beam in a straight line - if the head of the ring is too big it could obscure the laser’s line of sight, and distort the engraving (depending on the size of the hallmark). Get in touch with us if you have any further queries. What size hallmark counts as a Display Mark? Hallmarks above 1mm on jewellery, and above 2mm on silverware are considered Display marks. For hallmarks over these sizes, you will be charge an additional charge of £2.50 plus VAT per item. See Price List. How much does a bespoke hallmark cost? £174 for the punch, and £66 for laser set up, if required. 1mm minimum punch size (k), up to 6mm. Bespoke hallmarks are subject to approval. A Convention Hallmark is a type of mark applied by a signatory country of the International Convention on hallmarks. 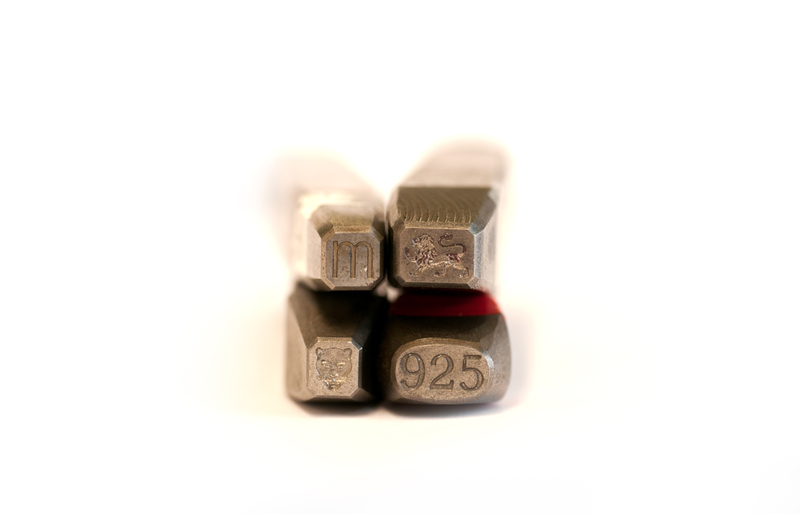 It comprises a sponsor's mark, the common control mark, the fineness mark and the Assay Office mark. The Convention mark is recognised by all member countries in the International Convention and items do not have to be re-hallmarked in the UK. Please see our download centre for further information on examples of marks and member countries. What is the difference between International Convention Marks and UK plus Common Control? Take a look at our Glossary of Terms on our Price List. A Common Control Mark forms part of the International Convention Hallmark, or can be added to a full UK mark at extra cost. Read more on UK & Convention Marks. An International Convention mark comprises of four hallmarks: Sponsor’s mark, Common Control Mark, millesimal fineness mark, and assay office mark. Can I send my precious metal clay items in for hallmarking? Yes you can, just as you would with any other items. Why do you strike the date letter and traditional fineness mark while other offices leave it off? The date letter and the traditional fineness marks are no longer compulsory components of the hallmark. However, we believe that the date letter is a very important component of the hallmark - it is the easiest way to date an item, and research has shown that most of our customers still want to see the traditional fineness mark on the hallmark. Unlike some of the other UK assay offices, we do not charge any extra to apply the two non-compulsory marks. Those only wanting the compulsory marks applied should indicate this on their hallnote. A sponsor's mark is a compulsory component of the hallmark and comprises the initials of the sponsor's personal or company name surrounded by a distinguishable shield design usually provided by the Assay Office. All sponsors' marks are individual and once allocated will never be re-issued to anyone else. You cannot use your company logo as a sponsor's mark; however, we can apply your company logo for you, as a non-compulsory optional extra, at the time of hallmarking with our hi-tech lasers. Please contact us for further information.